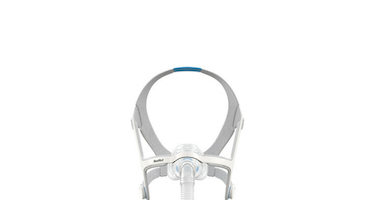 The AirFit™ N20 Nasal CPAP Mask with Headgear from ResMed is designed to help provide a proper seal to users with various facial structures. The InfinitySeal™ cushion, soft frame, and plush headgear provide comfort along with versatility. AirFit™ N20 Nasal Mask provides various points of adjustment and adaptability with the InifinitySeal™ cushion to help ensure a proper fit is obtained and kept throughout therapy. This is a nasal CPAP mask that provides therapy by covering both nostrils. Ensure the headgear and frame is kept at least 2" (50 mm) away from any active medical implant (eg, pacemaker or defibrillator) to avoid possible effects from localized magnetic fields. The magnetic field strength is less than 400 mT. Contraindications Use of masks with magnetic components is contraindicated in patients with the following pre-existing conditions: • a metallic hemostatic clip implanted in your head to repair an aneurysm • metallic splinters in one or both eyes following a penetrating eye injury.